Cricket helmets have become one of the most important parts of any cricketers kit bag. Cricket is an age old game and so it’s hard to imagine how for so many years this essential piece of cricket equipment simply didn’t exist. In recent years the whole manufacturing and more importantly the design process of cricket helmets has undergone a complete transformation. Whilst many leading brands had a range of batting helmets on the market, it was becoming apparent that the designs available were fundamentally flawed and the batsmen was still exposed to unacceptable levels of risk and harm from fast paced deliveries and even miscued shots off the bat. Extensive tests were carried out and new standards set. As a result of these new standards, all the big name brands had to stop making helmets and were instead sent back to the drawing board to completely redesign every aspect of the helmets construction, shape, manufacturing process and performance levels. Once redesigned, each manufacturer was asked to submit the prototype’s to the testing laboratory where each helmet was put through the paces. Those that passed the tests were brought to market, those that didn’t had to correct those shortcomings, as there was to be no shortcut solution. Whether it was Masuri, Gray Nicolls, Gunn and Moore, Kookaburra, Shrey, Ayrtek or Albion, each brand to prove its worth in order to come back into the marketplace and supply cricket helmets. Strangely it was two of the non-specialist cricket helmet brands, GM and Gray Nicolls that were amongst the first to release an approved cricket helmet to the marketplace. Needless to say, demand for the new helmets was strong as word soon spread to cricketers that a safe and fully approved helmet was now available. So common sense prevailed and the customers came out in numbers to purchase one of the new approved cricket helmets. What everyone was really waiting for though, was Masuri cricket helmet range and once it was released everyone saw that it was certainly worth the wait. The Masuri cricket helmet range was revolutionary. First of all it was to be manufactured in the UK, something no other brand had ever done before. Masuri went all out to produce a helmet that was extremely advanced in terms of technology and therefore in terms of safety too. The Halo system ensured an extremely rigid and safe peak area to the helmet, which was a big criticism of various brands before the approval process. Masuri also released two versions in the Elite and Test series and they soon became the preferred choice for most international batsmen around the world. Shrey cricket helmets also came into the marketplace. 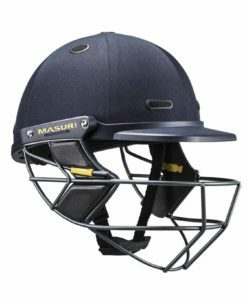 As a former manufacturers of the Masuri helmets, rather than lose all their business with the decision of Masuri to manufacture in England, they decided to bring out a new helmet and offering and this move proved to be a great success. As we come into the new season the Masurii range has expanded even more with both lower priced and medium priced models entering the fray. The range has improved in terms of quality and finish and with the Original Series MKII, we have Masuri tradition with the latest safety standards. 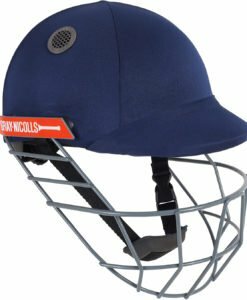 Gray Nicolls continue with their best selling Atomic and Test Opener cricket helmet models which are built perfectly and offer fantastic value for money. 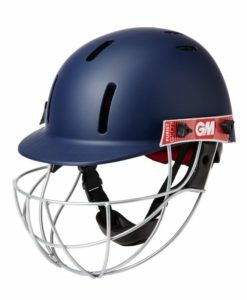 GM continue with the Geo and Purist helmet models and Kookaburra offer some fantastic helmets great prices in the 800 and 400 models. 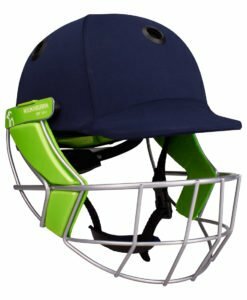 As one of the most important pieces of anyone’s kit bag the cricket helmet has finally been given the safety features it needed. As a compulsory piece of kit for all juniors, there is now a bigger choice than ever to all cricketers.